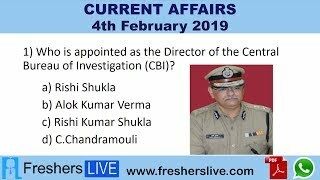 Current Affairs 4th February 2019: Instantly obtain Latest Current Affairs 4th February 2019 with all essential info, Be the first to know all the Current affairs 4th February 2019 top news, Major Issues, Current happenings, Important events in National as well as International level with clear explanation. For all competitive exams and Interviews, equip yourself with the Latest Current Affairs 4th February 2019 granted here. The U.S. special representative on North Korea, Stephen Biegun arrived in Seoul and held talks with his counterpart Lee Do-hoon. They discussed the pending issues including working-level talks with North Korea. The talk with North and South Koreans is ahead of the second summit between President Donald Trump and the North’s Kim Jong-un. The agenda of the summit is expected to be settled during the talks between Washington and Pyongyang. India’s Smriti Mandhana attained top in the ICC ODI rankings for batswomen, she grabs the first position after the match against New Zealand, whereas Ellyse Perry followed her in the second position and Indian ODI skipper Mithali Raj in the fifth position. In the ODI Bowler’s ranking, veteran pacer Jhulan Goswami is fourth, with Poonam Yadav at eighth, and spinner Deepti Sharma at ninth. Former Pakistan women's cricket team skipper Sana Mir became the first Asian woman cricketer to play hundred T20 international matches. The 33-year-old reached the milestone when she walked into the field for the ongoing third and final T20I against West Indies in Karachi. Sana is the sixth woman cricketer to complete a century of T20 Internationals. Daendra Dottin of West Indies tops the list with a total of 109 T20Is to her name.